For a couple years I had occasionally come across posts from writers I follow about their family's food sensitivities leading them to switch from conventional wheat to Einkorn. "Einkorn is very different from all other varieties of wheat. It was the first species of wheat grown by man more than 12,000 years ago." Since then it has never been hybridized and remains the purest (and easiest to digest) form of wheat known today. "Like einkorn, most plants are diploids, which mean they have one set of chromosomes from a male parent and one from the female parent. When other species of wheat were created, additional sets of chromosomes were added. Emmer wheat was created roughly 2,000 years after einkorn by the hybridization of two wild grasses adding two sets of chromosomes. 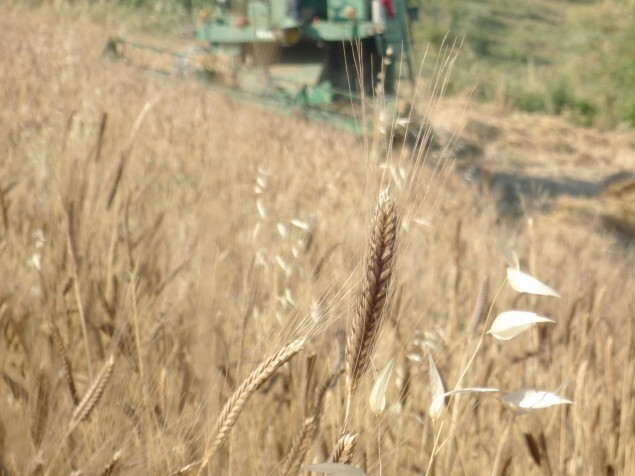 Kamut®and Durum Wheat are descendants of Emmer. Spelt was the first wheat hybridization that occurred with the help of man between cultivated emmer and a wild grass, creating a species with six sets of chromosomes. Common bread wheat descended from spelt." Why does this matter to me? Several people in my family, while not fully allergic, are sensitive to wheat, and feel the all-too-familiar "wheat bloat" after eating much conventional wheat. Enter Einkorn - the wheat we can all enjoy. While it ends up being a little bit more expensive than standard flour, the results are more nutritious, and noticeably more delicious. I have had several non-bakers ask me for the recipe and a lesson after tasting homemade einkorn bread. Even if our youngest family member grows out of her sensitivity, we will continue to enjoy this newfound addition to our lives. If you're interested, I could wax poetic about my love for this grain - someday I hope to buy a high quality grain mill so we can grind our own fresh flours. Until then enjoy this teaser, and thank you Jovial! This is my own personal experience and in no way a paid advert for them. Also please note, that while many with wheat sensitivities can fully enjoy einkorn free of discomfort, it does still contain gluten.